And we stand here in the shadow of the mountain on the plush green carpet of the nahele, breathing in the sweetness of the laua’e and yellow ginger around us, and we remember… “Here” can be anywhere at all in these islands because there can be no spot in Hawai’i which does not fall into the shadow or the glory of the Pali Pass and the final battle for a united kingdom (The Battle of Nu‘uanu Pali – 1795). 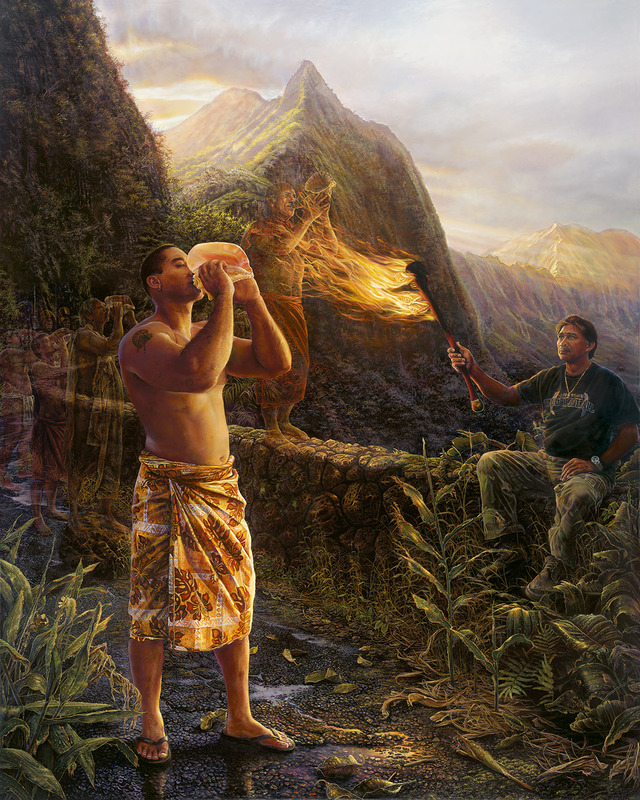 In this painting, I have included images of all three sons of Hattie Hoolulu Kuia from Maui (lineage of Kameeiamoku through his fourth wife.) Immediately behind my real life model is Kamuela, the eldest of the three and my husband. In the back, portrayed as High Chief Hoolulu next to his cousin, Kamehameha the Great, I have used Kamuela’s younger brother, Al, to model as his own ancestor. In the foreground, the youngest of the three brothers, Moses, sits on the wall, holding the running torch. My real life model, sounding the pü, is Dalton, son of Moses. Farthest up the wall, visible next to Dalton’s arm, is a small image of Kamuela, Jr., son of Kamuela. The spirit standing on the wall in the middle of the painting is my friend, Likeke (Bell), whom I paddle with at Ānuenue Canoe Club. He has sounded the pū at the Ilikai almost every day for the last forty two years. Along the extreme left of the painting is my nephew, Henry. Mai poina ‘oe i ke koko o nĀ kŪpuna o Hawai’i. Kū i ka pono.